Freshwater crabs come in many shapes and sizes, and with many varied care needs. Learning the dietary, environmental and social needs and restrictions of the most commonly kept freshwater crabs will give you a solid starting place for crab stewardship -- but you must also thoroughly research your individual crab's species before bringing him home. Not all crabs labeled as freshwater at the pet store will actually thrive in freshwater for the long term. 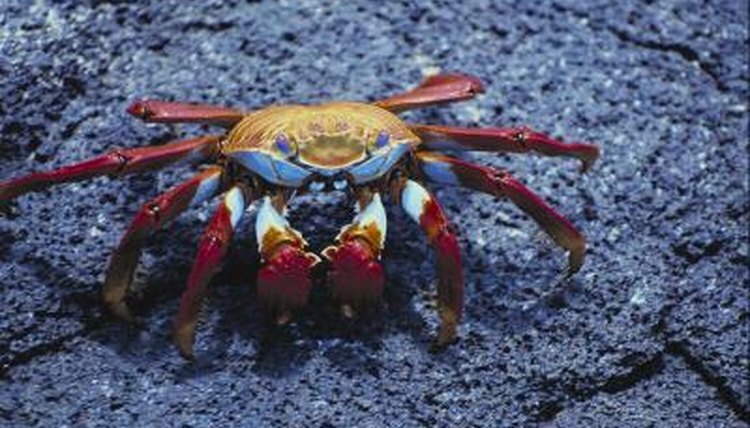 The rainbow crab grows to around 3 inches, not counting legs, and has a tendency toward aggression. A rainbow crab needs a 50/50 split of land and water in his aquarium, a secure top to hinder escape, a hiding place and a temperature between 75 and 85 degrees Fahrenheit. A rainbow crab can thrive in freshwater unless raised in brackish water -- he'll need to stay in that; the change can be fatal. He will eat almost anything, including fruits, vegetables, fish, meat and crab pellets, and will need a calcium supplement like cuttlebone or egg shells. Rainbow crabs do best alone, since they have a tendency to fight other crabs and eat smaller fish. Young crabs will lose their exoskeletons and grow new ones every few months; older crabs do it once or twice a year. During molting they may stop eating and hide. Do not touch your crab until he's grown a new, hardened shell -- doing so may cause him to go into shock and die. Leave the old exoskeleton in the tank so your crab can eat it and benefit from the calcium. The micro-crab, also known as the spider crab or false spider crab, is fully grown at 0.4 inch, not counting legs. He is fully freshwater aquatic and gets along well with other micro-crabs and fish -- although aggressive fish species may see him as prey. A micro-crab can live mainly off the algae and detritus of the tank and does not need special supplements. He can handle temperatures between 72 and 82 degrees Fahrenheit, although he will be more active in temperatures above 79. To breed micro-crabs, you need an overhead tank light so the offspring can navigate the tank. The red claw crab should live in a 10-gallon tank with a few resting places, such as long pieces of wood, along the water level to give him the opportunity to crawl out. You can house several crabs together as long as you have only one male per tank. This crab can be kept in freshwater, but he will thrive much better in brackish water with specific gravity of around 1.005 and temperatures between 75 and 80 degrees Fahrenheit. The red claw crab is omnivorous, eating shrimp pellets, vegetation, tubifex worms and other foods. You will need a secure tank lid to prevent escape. Fiddler crabs are frequently advertised as freshwater crabs by pet stores, but the qualification is not accurate. While fiddlers can survive in freshwater for short periods of time, they need brackish water to thrive, ideally with specific gravity of around 1.005. More than 100 subspecies of fiddler crab exist, and they have similar needs. Your fiddler will need a sandy substrate, a secure lid and a tank that has a 2-to-1 ratio of land to water, ideally with tank features for climbing on and burrowing under. He can live on artificial fish food and floating dead oak or beech leaves. Be careful to avoid high-protein-content foods, as these can result in poisonous levels of nitrite in the water. An aeration tube will help keep the water fresh. When you originally set up the tank, mark the water line. As water evaporates, add freshwater, not saltwater, to meet the line again, as the salt in the tank will not evaporate with the water. Knowing the specific needs of your crab's species is the first step to giving him proper care and a long, healthy life. The species will determine your crab's diet, environment and appropriate tank mates. Always ask what type of water your crab was kept in before taking him home; sudden changes, regardless of your pet's biological abilities, can be fatal.